Made in England, United Kingdom, Europe, 1955-1958. Aircraft engine, Double Mamba Mk 100, propeller axial gas turbine, made at the Armstrong Siddeley Motors Limited factory, Parkside, Coventry, England, designed by the company's chief designer, A. Thomas and technical director, Bill Saxton, used in a Royal Australian Navy's Fairey Gannet carrier-based, anti-submarine aircraft from the late 1950s. The Double Mamba 100 axial gas turbine propeller engine comprises two Mamba engines placed side by side, each driving a 4-blade propeller but sharing a common inlet casing and installed as a single powerplant, The propellers counter rotate and have the unique capability of operating independently. They each have their own fuel, lubrication and control systems and each drive one of two coaxial propellers. The port engine drives the front propeller and a common auxiliary gearbox is driven by either engine or both. This allows the pilot to stop one of the engines and feather its propeller in flight, the advantages being that one engine and propeller could be shut down to reduce fuel consumption and increase long-range cruising surveillance and save time. Furthermore, the engine could run on kerosene, wide cut turbine fuel or naval diesel readily available on warships, eliminating the need for high-octane gasoline. The Armstrong Siddeley company began aero engine development and production when the Royal Aircraft Factory ceased building production engines from February 1917. In January of that year major F M Green left the Royal Aircraft Factory to join Siddeley-Deasey Motor Car Company as chief aeronautical engineer with the task of redesigning the BHP (Beardmore Halford Pullinger) 6 cylinder aero engine. This engine became the Siddeley Puma and was built in larger numbers than any other of its day. When work on the development of the Puma finished, Green focussed on his radial engine that he had designed while at the Royal Aircraft Factory. This engine became the Siddeley Jaguar. Between the wars work continued on developing a variety of radial aero engines with general success. Between 1939 and 1941 Armstrong Siddeley Motors worked on an Air Ministry contract to build a gas turbine engine that had been suggested by A A Griffiths of the Royal Aeronautical Establishment about 1930. When in 1942 Armstrong Siddeley Motors was given a contract to design and develop their own gas turbine engine they began work on the ASX which ran in 1943 and flew in 1944. Its power to weight ratio was not good and a propeller gearbox was added but the engine was heavy. Without any competition Armstrong Siddeley was given the contract to produce the engine, originally called ASP but renamed Python. The Python entered service in 1953 in the Royal Navy's shipboard fighter, the Wyvern S4. The experience gained with the Python allowed the development of the smaller Mamba engine. The Mamba and Double Mamba axial gas turbine engines were developed by Armstrong Siddeley under the supervision of Mr H T Chapman (director and general manager) and by the Armstrong Siddeley design team led by Mr W F (Bill) Saxton, MBE, (chief engineer), Mr W H Lindsey, MA (deputy chief engineer) and Mr A Thomas, MBE (chief designer, aircraft engines). The Mamba ran on the test bed in April 1946 and first flew on October 14, 1947 in the nose of a modified Lancaster test bed aircraft. A Mamba engine was then supplied to Boulton and Paul for fitting to the Balliol aircraft and another sent to Avro for their Athena aircraft. Civil versions were installed in the Miles Marathon and the prototype Armstrong Whitworth Apollo. The Mamba project design had been completed in late 1945 and the design and development of the Double Mamba began in late 1947 with the prototype of the latter being bench tested early in 1949. As the name implies the Double Mamba was made from two Mamba 2 engines of 1,250 shp side-by-side, attached to a common reduction gearbox. The engines each drove four-bladed propellers which were counter-rotating and co-axial. Although this twinning of turbine units was also tried by Bristol with the Proteus for the Bristol Brabazon Mk2 and Saunders-Roe Princess and proposed by Napier with their Naiad turbine and Allison in the United States, it appears that only the Armstrong Siddeley Double Mamba went into series production. The Mamba engine was available for use in the famous airliner, the Vickers Viscount but this aircraft was ultimately powered by the Rolls Royce Dart and the Mamba, in the form of the Double Mamba saw sterling service in the Fairey Gannet naval reconnaissance aircraft. The final AEW.3 (Airborne Early Warning) version was powered by the Mk. 102 Double Mamba engine of 3,875 shp. Made at the Armstrong Siddeley Motors Limited, Parkside, Coventry, England, a branch of the Hawker Siddeley Group. 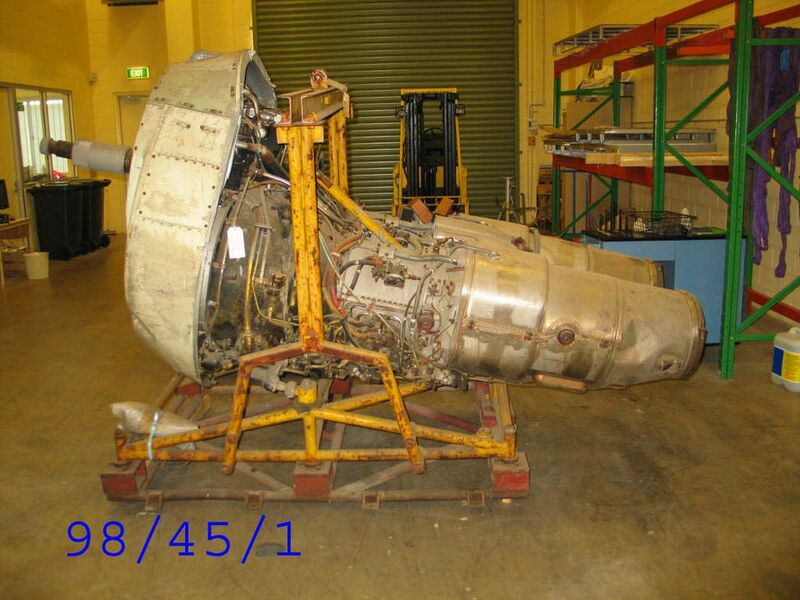 The Double Mamba engine was used as the power source in one of 36 Fairey Gannet AS1 and T2, carrier-borne anti-submarine aircraft used by the Royal Australian Navy between 1956 and 1967. In the early 1950s the Royal Australian Navy was given approval by the Federal Government to modernise its Fleet Air Arm with the next generation of carrier-borne aircraft. This decision coincided with the completion of Australia's new aircraft carrier, HMAS Melbourne, and involved replacing the Sea Fury aircraft with the Sea Venom and the Firefly with the Fairey Gannet. The Gannet was built by the Fairey Aviation Company Ltd of Hayes, Middlesex, England, and the first consignment was delivered in October 1955. The Gannets served on the carrier, HMAS Melbourne for the entire period. The Gannet carried a crew of three, the pilot and observer/navigator were accommodated in the two forward cockpits and housed in the rear cockpit, in rearward facing seat, was the radar operator. The aircraft had an inital rate of climb of 2,000 ft/min, a ceiling of 25,000 ft, speed of 299 mph and range of 662 miles. The Gannet carried no guns but 2 torpedoes in the bomb bay and 16 x 60 lb rocket projectiles under the wings. The Gannets remained in first line squadron service until 1967 despite several attempts during the early 1960s to withdraw fixed wing aircraft from the Fleet Air Arm and rely soley on helicopters. The Gannets were eventually replaced with the US Grumman S-2E Tracker.